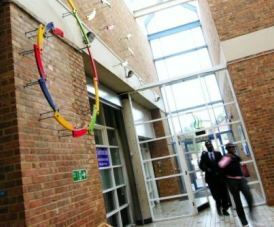 High Road Business Centre is a colourful office space that is situated in Tottenham, London. There is a wide range of suites in the building that are available to let in small or large sizes. Each serviced office has furniture in place and includes all the vital necessities to run a company such as IT points and telephone handsets. With a glass atrium at the location, this site also has car parking facilities and a bicycle storage area. The main reception is manned at all times and the trained staff can assist with day-to-day duties such as booking boardrooms or with admin support. Boasting a wide range of features in the property, this office to rent has kitchen facilities to make tea or coffee and toilettes are on every level of the building.